If you want to try to implement a standard naming convention for people to follow, it would be very helpful for people to be able to easily remind themselves of what it is. If there was help text on a record name field, one could easily do this. While help text on standard fields is "resolved", per Salesforce Support, you still can't create help text for a standard "record name" field (on a standard object or on a custom object). According to Salesforce's explanation of help text for standard fields, it seems that one should be able to do this. 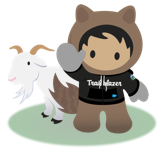 They say: "Field-level help is not available for some standard fields, including fields on the User object, system read only fields, auto-number fields, multi-currency fields, Salesforce CRM Ideas fields, and Community fields." The help desk response: The field that you are referring to does not apply to being able to do help text on. The reason for this, is that fields on custom objects that you create that are the main field to label the records do not have help text. Just bumped into this myself - I want to encourage our users to use a common naming format for record names in a custom object. I have no way of reminding users of our naming convention for new records. (I'm in Lightning.) This would be very useful. Tried your workarond which displayed perfectly in Classic! Thanks. However, it wouldn't display in Lightning... Any workaround ideas for LEX too? Definitely would be useful to inform users of what is required to be entered to retain consitency of entries. 8 years on - please let's get this happenning. hey 2011 gorav - nice idea! buddy! this one just made it into my most awesome list of 'little' things that would make sfdc a lot better. Help text guides users on how to enter the correct data. Not having this randomly looks like implementers just forgot about it. Help text is a critical aspect of a successful implementation. This is absolutely needed to implement successful naming conventions on name fields. What is the status of this release @salesforce? We've found that you can work around this limitation using an IDE and editing the object metadata, and adding the Name field into the list of fields for the object. This would be very helpful. We are using the Name field with a lable of Class Code - but Class Code has a verbal name as well as a numeric name. It would be nice to provide help text on what we are expecting in this field. This is vital to helping my end users succesfully complete certain activities in Salesforce without having to constantly handhold them through the process when they forget how this works. What is the reason for not providing help texts on record name fields? Thank you for your comment, @scott molinari. I know the ways to get around it and have for some clients. In this specific case, there would need to be major effort in logic building and new data points that are not currently in salesforce. The user already has all of the information they need. They just need to remember in what order to put them. Just a simple hover help (like they have on every other field that they see) would be lovely. @Stacy Hyatt - If you have a standard way the Name field should be set up, simply use a workflow to create the name systematically. I know that doesn't help directly either, because the field is always mandatory, but at least the name will always be correct to the standard. And the users will sooner or later realize the system makes the name for them, so they'll end up just adding a single character of some kind. This automation of the record name is very helpful for Opportunities, for instance.